We are the leading Manufacture & exporters our range of High Resilience PU Foam has a resilience greater than 45% which results in good recovery and ultimate comfort. 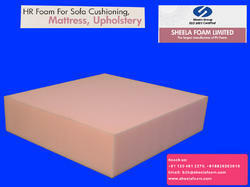 It is the only cushioning foam having all the qualities of a Natural Latex. Due to which these are used all over the world. These are used in creating quality bedding and furniture. We are the leading Manufacture & exporters offer High Quality Bedding Foam known for its features like good recovery and ultimate comfort. These foams have resilience greater than 45%, thus ideal for mattress overlays, bed rest, soft bags, furniture and cushioning purpose. Our bedding foam complies with IS-7888 and ASTMD: 3574. These are available in following grades & specifications.